Absentee Voting by Mail has Started! This morning along the Volcano Hwy. Jen and Austen going 55 mph. And how does Jen Ruggles act on this knowledge? She gets out on the streets and lets the voters know there is a choice. She sign waves on the Volcano Hwy. Thursday 7/21, Monday 7/25, Wednesday 8/10, Thursday 8/10 and Friday 8/12, from 6:30 am to 8:30 am in Panaewa, (Mamaki St. town bound, if available) she is greeting Puna commuters. She got a warm reception with waves and car honks this morning. How about joining in for a morning or afternoon? Jennifer Ho with Flower greeting the morning commuters in Panaewa. Or if you are in a car, give a friendly wave and a toot on the horn. Come join in the action. It is now a sprint to the finish line. And donʻt forget to toot as you pass by. And what does Jen do after this? Why she went back to meeting her constituents by going door to door. Shes got the energy and focus to be a great public servant. Our evening sign waving schedule is Friday 7/22, Monday 8/1, Wednesday 8/3, and Friday 8/12. All at 4 pm to 6:60 pm near Macadamia Dr. leaving Hilo side. As always, be safe and drive with Aloha. Remember, Absentee Walk in Voting starts on August 1. in Hilo and Kona. 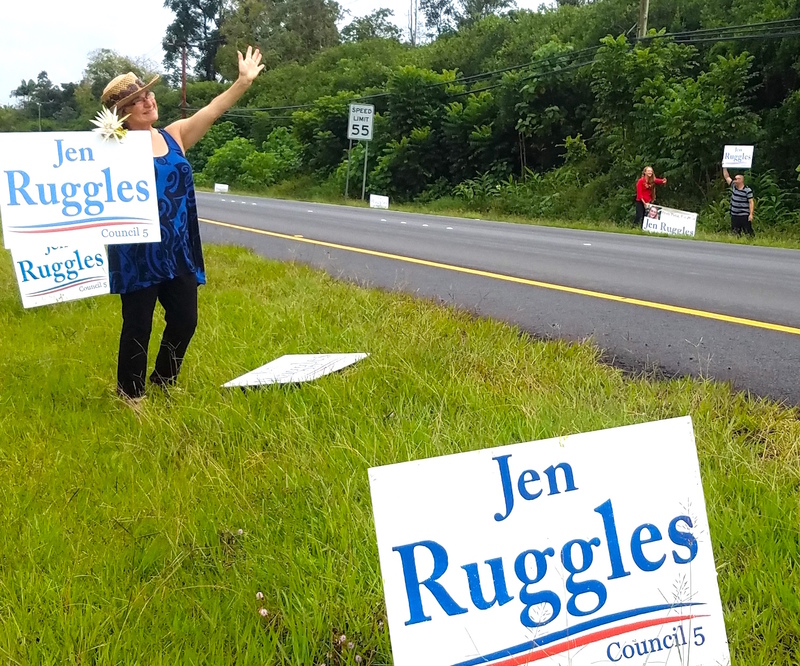 GeneralTagged campaign, Council District 5, registered voters, Volcano Hwy.